TBR – Selma, AL — Visionary and Gospel Award winning Recording Artist Deitrick Haddon and Apostle Veryl Howard of Faith Management recently teamed up with Mayor George Evans and Pastor Angela Fincher for the first ever “Save Our City Youth Prayer March” in Selma, Alabama. The historic March which drew over 500 in attendance was led by Deitrick Haddon and Friends including National recording artist Todd Dulaney, Ruth La Ontra, Caribbean artist DJ Nicholas, Pastor Clareta Haddon, “Fearless Love”, “Preacher Boy”, Pastor Guy Reeves, Pastor John Grayson, Pastor Lawrence Levi, DJ Dushawn Watkins, Pastor “Bubba Stewart” and Shea Taylor winners of “America’s Got Anointing”. Local pastors, political leaders, Selma citizens and global visitors prayed as they walked across the famous Edmund Pettus Bridge where Dr. Martin Luther King marched for African Americans to have the right to vote. In remembrance of “Bloody Sunday” that took place fifty years ago for liberty for all, this march to “Save Our City Youth Prayer March” was created in that same vein. People came from as far away as Louisville Kentucky, Mississippi, Birmingham, SC, NC, Washington, DC, Chicago, Atlanta, Tenn., Baltimore, and Philadelphia just to be apart and show their support of this year’s historic youth march. Film Producer Joshua Coates, Vindictive Magazine, Diddy Coffee TV Show, G-Tube Network TV, Praise 108 TV, The Now Network also participated in the March. Marchers prayed together against “Bloody Sundays among the youth”, gang violence, poverty, drug trafficking, illiteracy, teen pregnancies and teen STD’s. They prayed against desolation in Selma and for the people of Selma to be encouraged with hope for their future. Selma, Alabama is the poorest city in Alabama and more than forty six percent are poverty stricken with an average income of $16,000 per year. 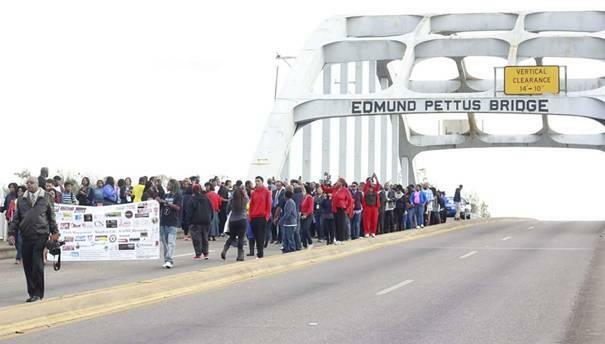 These prayer warriors marched together with Selma residents hoping to instill some hope. The March which lasted a little over a mile concluded at the steps of Mayor George Evan’s office where many addresses were rendered to the people. Apostle Veryl Howard, Deitrick Haddon and Selma’s own Mayor George Evans along with Pastor Anglea Fincher addressed the community with encouraging words. There was a spirit of unity as the people came together in love and hope. The day ended with a benefit concert held at Ellwood Academy featuring Deitrick Haddon along with the other national recording artists. Many who attended said they found purpose in standing in the gap with their brothers and sisters in Selma, Alabama. This is only the beginning of prayer vigils that will be spearheaded by Deitrick Haddon and Apostle Veryl Howard as a means to reach our youth.